When she became principal four years ago, Garrett decided to get her teachers out of their classrooms — and comfort zones — for an afternoon. Once a year, just before school starts, they board a pair of yellow buses and head for the neighborhoods and apartment complexes where Hobgood students live. En route, the bus driver describes over the intercom how he picks up 50 children at one complex each morning. The teachers pump themselves up with a chant. After all, they're doing something most people don't enjoy: knocking on doors unannounced. When the caravan arrives at a cluster of apartments, the teachers fan out and start knocking on doors of known Hobgood families. Some encounters don't get beyond awkward pleasantries and handing over fliers about first-of-the-year festivities. Others yield brief but substantive conversations with parents who might be strangers around school. Jennifer Mathis has one child still at Hobgood and says she appreciates that the school came to her — since she has a hard time getting to school. "I don't have a car. I can't drive because my back got broken in two places," she tells a trio of teachers standing in her doorway. "I'm a mom. I can't be there with all of them all the time." There was a time when a teacher showing up on a student's doorstep meant something bad. 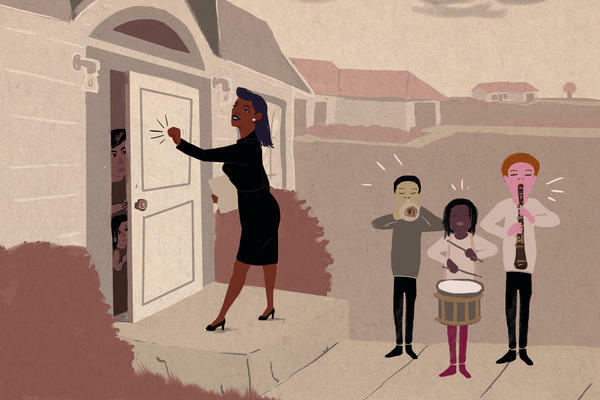 But increasingly, home visits have become a tool to spark parental involvement. The National Education Association has encouraged more schools to try it out, and there's this national effort. One district in Massachusetts just added money to pay teachers for the extra work involved. Traditional schools in Washington, D.C., tried out home visits after privately run charter schools used them to successfully engage parents. In Murfreesboro, principal Garrett sees the brief visits as mutually beneficial. Parents get to meet their kids' teachers. And teachers get a clearer sense of the challenges many of their students struggle with on a daily basis. "If a kid doesn't have a place to sleep or they have to share the couch with their siblings at night and there are nine kids with one bedroom or two bedrooms, it's important for them to see that — not to be sympathetic," she says. "It's to empower the teachers to change the lives of the kids." It's serious business. But Danielle Hernandez, a special education teacher, says it's not the somber experience she'd feared. At one apartment complex, a dozen kids are out riding bikes on their last day of summer break. "I know that these children, they go through a lot in their lives," Hernandez says. "But they get to have so much fun." Teachers join in on that fun, borrowing kids' bikes for a cross-parking-lot drag race that generates howls from the adults. Ashlee Barnes, a fourth-grade teacher at Hobgood, says she's a believer, even if home visits have yet to prove themselves as a difference-maker on standardized testing. "We become more important in their lives than I think we can ever understand," she says. "I think the sooner you can start a relationship, you're going to see results on their performance in the classroom." The kids seem to genuinely enjoy the visits, even if they are a reminder that summer is over. "I am so lucky," says fourth-grader Shelleah Stephens as she's introduced to Barnes, her new teacher. "All the teachers I have had have been so nice. It's great to see you." Barnes hugs Shelleah, who is barefoot on the sidewalk in front of the unit where she lives with her father, Kenny Phillips. He's standing back, smiling as his daughter shows off her budding social skills. "It just brings you this joy. It makes me want to cry," Phillips says. Phillips runs a landscaping business and says long days have kept him from being as involved with his daughter's education as he'd like to be. Seeing this interaction has him a little choked up. "It's just good to see her grow up and have people around her who care," he says. "Sometimes parents aren't there, man. Sometimes we gotta work. Sometimes we're gone a lot of the time. It's good to see [teachers] come out to the neighborhood like that. I know she's in good hands." Phillips also grew up in Murfreesboro but says no teacher stopped by his house. He hopes to return the favor by making sure Shelleah finishes all her homework this year. BLAKE FARMER, BYLINE: Ninety percent of students at Hobgood Elementary are growing up in low-income households, and Principal Tammy Garrett says most of her teachers don't know what that's like. TAMMY GARRETT: If you only grow up and you only know middle-class family, you may not understand, at times, maybe why they don't have their homework or why they're tired or those kinds of things. FARMER: So when Garrett became principal four years ago, she decided to get teachers out of their classrooms and comfort zones for an afternoon and onto a pair of yellow school buses. UNIDENTIFIED PEOPLE: (Chanting) Hey, hey, hey, hey Hobgood. FARMER: They're trying to get pumped up because they're doing something few enjoy - making cold calls. JANE MARSH: Hello? It's Hobgood Elementary School. FARMER: After a few more knocks, the door to this first-floor apartment cracks open. MARSH: It's Mrs. Marsh. Hi. FARMER: Many of these unannounced visits don't get beyond awkward pleasantries and handing out flyers about first-of-the-year festivities. Some yield brief-but-substantive conversations with parents like Jennifer Mathis, who might be strangers around school. JENNIFER MATHIS: I don't have a car. I can't drive because my back got broken in two places. I can't be there with all of them at all one time. FARMER: This is the kind of real talk Principal Garrett hopes for. GARRETT: You know, if a kid doesn't have a place to sleep or they have to share the couch with their siblings at night and there are nine kids with one bedroom or two bedrooms, it's important for them to see that - not to be sympathetic. It's to empower the teachers to change the lives of the kids. FARMER: It's serious business. But Danielle Hernandez, a special education teacher, says it's not the somber experience she'd feared. She's in an apartment complex that 50 students call home, many of them out riding bikes on their last day of summer break. DANIELLE HERNANDEZ: I know that these children, they go through a lot in their lives. So - but they get to have so much fun. FARMER: After a few minutes, teachers joined in on that fun, borrowing kids' bikes for a cross-parking-lot drag race. The kids, too, seem to genuinely enjoy the visit, even if it is a reminder that vacation's over. SHELLEAH: I am so lucky. UNIDENTIFIED WOMAN: Oh, you're sweet. SHELLEAH: It's great to see you. FARMER: That's Shelleah Stephens, the daughter of Kenny Phillips, who lets his fourth-grader show off her budding social skills. KENNY PHILLIPS: I'm just sitting back and just smiling, man. You know, it just brings you this joy. Like, it makes me want to cry, man. FARMER: Phillips runs a small landscaping business and says long days keep him from being as involved in his daughter's education as he'd like to be. Seeing this interaction has him a little choked up. PHILLIPS: It's just good to see her grow up, really, good to see her grow up and have people around her who care. That's the main thing. Sometimes parents aren't there, man. Sometimes we've got to work. Sometimes we're gone a lot of the time. It's good to see, you know, come out to the neighborhood like that, man. I know she's in good hands. FARMER: Phillips says when he was growing up, no teacher stopped by his house. He says he'll return the favor by making sure Shelleah finishes all her homework this year. For NPR News, I'm Blake Farmer in Nashville. Transcript provided by NPR, Copyright NPR.